As someone who loves a good tutorial and knows just how much work goes into one, I think its only fair they get a wee bit more attention. Thus, the Steal this Idea* series was born . 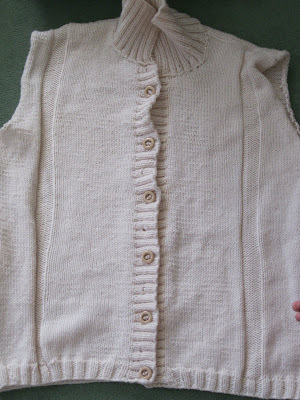 Today's tutorial is from Sarah, of Modern Country Style, who emailed me this clever reuse of an old cardy. 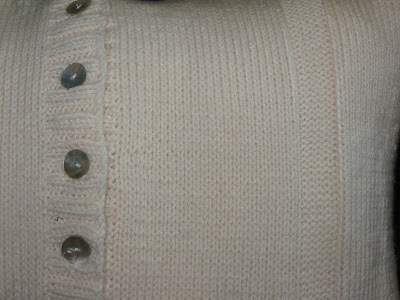 We all have at least one old cardigan sweater laying around and Sarah was kind enough to share the lowdown on how to turn it from trash to treasure. ...replaced the buttons and sewed the whole thing together. 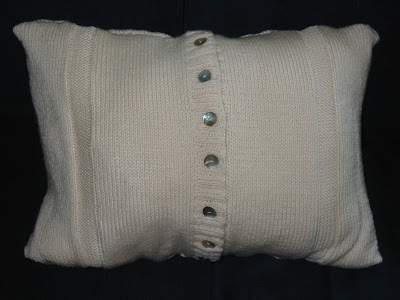 Using the placket you can just slip a pillow form right in. Check out her detailed instructions here. For inspiration, here are some other adorable versions from Woman's Day. I have at least two sweaters that I'm eyeing with sharp scissors in hand for this. Such a simple concept but a great idea if you have the materials laying around. And when I get tired of my sweater pillow I won't feel so guilty parting with it. This is a really clever Idea! Love it!!! i remember when those first came out..loved them..and still do. perfect! I'm trying this when it actually gets cooler than 85 out! I have headed to the thrift store for that exact reason. To find sweaters I would lve to be pillows for my couch. I did turn a cabled sweater in to a stocking for my niece a couple years ago. It turned out soo cute! Love this idea! My grandmother passed away earlier this year and this is such a great idea for all of her sweaters that she had that we didn't want to give away but aren't going to wear. I'm bookmarking this! Thanks for the idea. How amazing to see my cushion on your amazing blog! Thank you SO much for featuring Modern Country Style. Love this look, especially for fall and winter. They look so cozy. I love LOVE this idea. 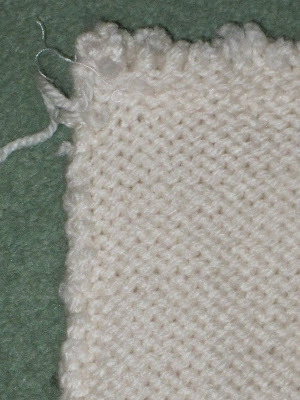 I tried to knit a cushion cover like this but I never finished it. Now, I can just do this and it is simpler and cuter! I love this idea, will be scouring the op shops this week for lovely cable knit jumpers. Perfect Autumn project! Love this one!! I've been loving this kind of pillow lately! Especially for fall! I don't have a sweater I'm willing to cut up, but I bet I could find one at a thrift sort that would make a great pillow! these are such great fall and winter accessories... have a nice one! Genius! I love this idea and recently fell in love with a sweater pillow at West Elm that was just too pricey! I will steal this idea...I love it! Just found you from journey chic blog and looking forward to sharing your info with my own readers so hope to see you at my blog also.